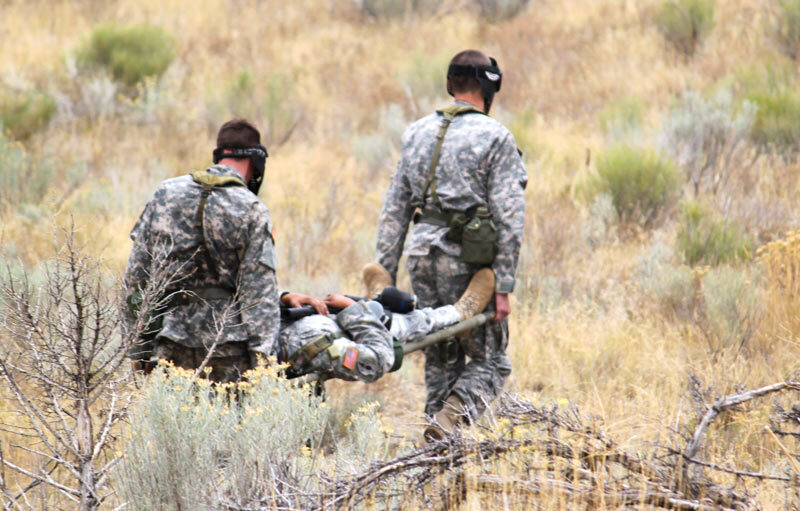 CAMP WILLIAMS—Utah State University’s ROTC program recently hosted teams of cadets from 14 colleges and universities at the annual Ranger Challenge at Camp Williams, near Herriman, Utah, for a series of military competitions. 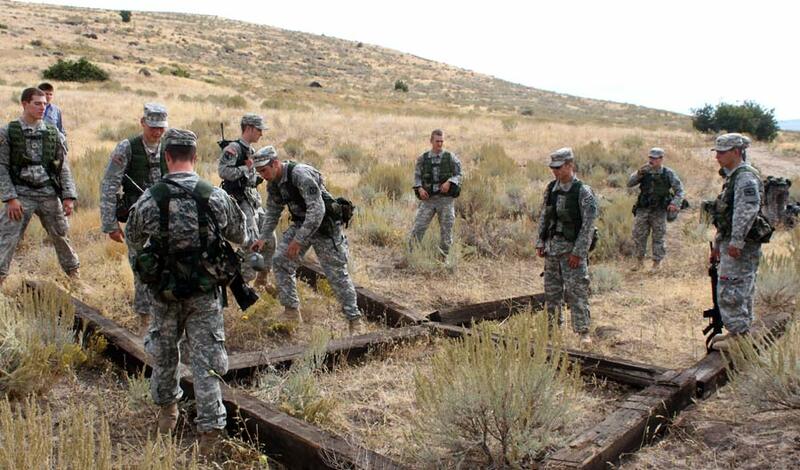 The day-long competition started at 6 a.m. and lasted until late afternoon as Reserve Officer Training Corps teams from Utah, Wyoming, and Colorado competed. During the event, teams from each school (consisting of 10 men and two women) were given a set of coordinates and used navigational skills to find the location of the next challenge. The 12 challenges were designed to test the cadets’ skills in logic, strength, speed and agility. The team who could complete the challenges in the fastest overall running time would be named the winner. “We’ve been training for this competition year-round,” said Solomon Smith, a USU ROTC cadet and liberal arts senior. Smith said USU’s team had practiced six days a week at 5:30 in the morning in preparation for the competition. The first event of the Ranger Challenge was the one-rope bridge, a challenge course in which ROTC cadets were challenged to cross the Jordan River in 12 minutes using a single rope. Points were awarded for the number of people each team was able to get across the river. “The rope bridge was awesome!” said USU sophomore Zachary Smith. After completing each event, the teams raced uphill to perform the next challenge. Cadets had to carry 30 pounds of equipment on their back through the duration of the event or lose points. 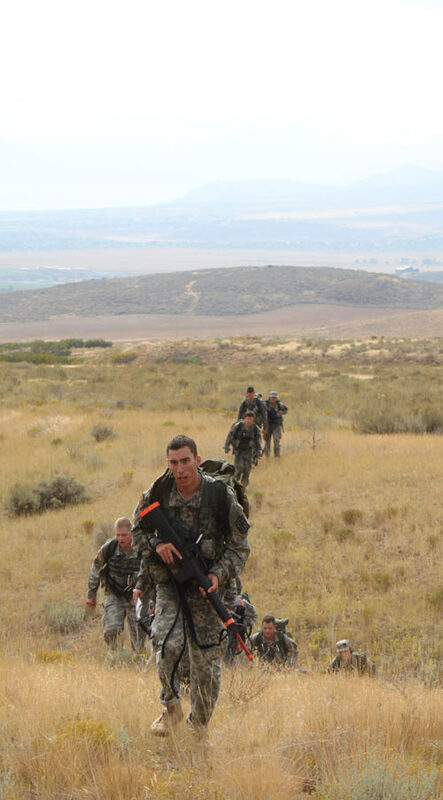 “It has been challenging to ruck [hike] this far,” said Wyoming cadet Charles Schull. During the weapons assembly and disassembly event, cadets broke down and then reassembled three weapons with a 15-minute time limit. According to Sgt. 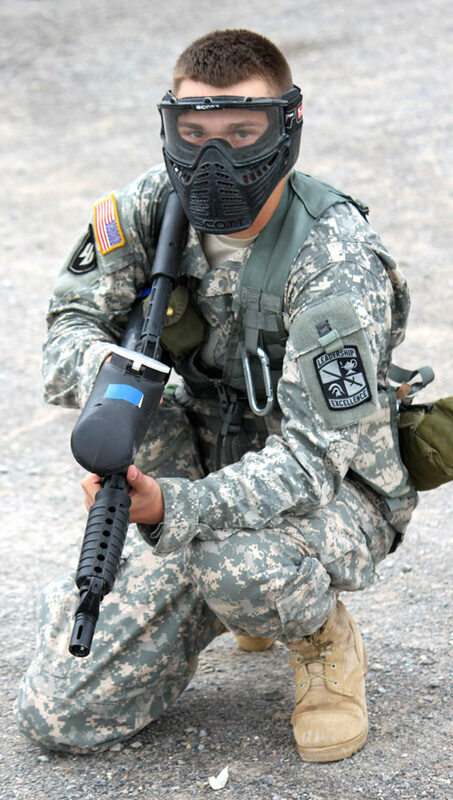 Martin Lopez, a Colorado State University ROTC student who oversaw the weapons event, Utah State University outperformed all of the other universities by finishing the event in around 2-½ minutes. “It was impressive—the be st time we’ve had all day,” said Lopez. 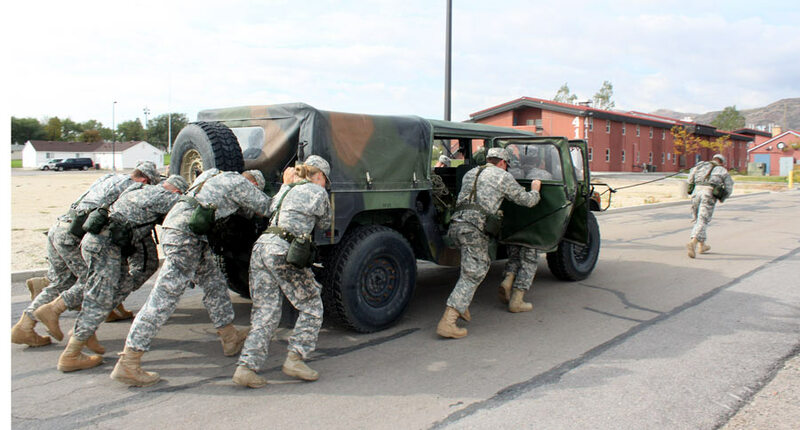 Other events in the Ranger Challenge included pushing an Army Humvee through the streets of Camp Williams, firearm practice, and a medical evacuation drill in which cadets had to carry stretchers across a field while under fire (a simulation using paintball guns). “The humvee push was the most challenging thing for me,” Schull said. The purpose of the challenges, said Sgt. 1st Class Lawrelle Cook, is to force the cadets to solve problems under stress to simulate a war situation. “We ’re trying to test the teams’ ability to look at the problem and overcome the problem,” Cook said. At the end of the day, the times for each event were totaled and points earned were deducted from each team’s time. The USU ROTC team placed fifth out of the 14 teams with a total time of 5 hours and 22 minutes, behind first-place winner BYU (3:47:41), Colorado State, Utah Valley University, and the University of Utah. Great story Alison! I am glad you covered our event!! !